Many years ago, Dr. Carl Baar, co-author with the Hon Jules Deschenes, of the Judicial Council of Canada report “ Masters in Their Own House”, the report that sets out the facts of the Provincial Administrations using their Administrative control of the working lives of the Queens and Appeal Bench Judges to dictate Judgements to those Judges, note Web site segment dated July 26th 2007 ZONING PROBLEM WITH A RURAL MUNICIPALITY?, advised me (Lee) that the only option that anyone has to obtain Justice out of Canada’s Justice system is to keep turning the rocks over so the public can watch the Government bureaucrats crawl away to get under another rock, which is what I (Lee) have been trying to do on behalf of the Earle Argue family of Regina, note Web site segment dated August 25th, 2009, TURNING OVER ROCKS. 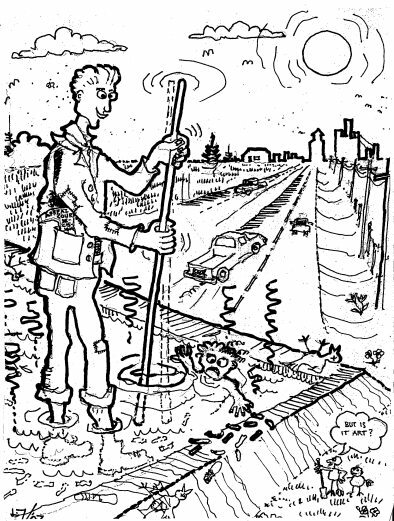 The fact is that Dr. Baar’s reference to turning over rocks is a common, much used, euphemism for uncovering corruption in Government, but a long time friend, familiar with the activities of Government bureaucrats, coined a much more descriptive and fitting phrase, he called it “stirring in the sewage lagoon” and drew a cartoon depicting someone who looks much like me (Lee) doing exactly that, ie. You are currently browsing the Rural Zoning in Saskatchewan blog archives for January, 2010.